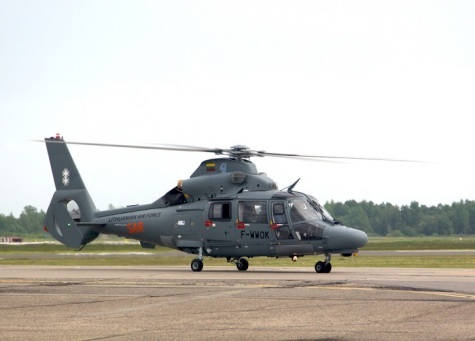 On June 2 the Eurocopter AS365N3+ Dauphin, the new helicopter of the Lithuanian Air Force landed at Šiauliai Airbase. This is the first of the three search and rescue helicopters contracted for by the Lithuanian Armed Forces together with the Ministry of Environment from EU funds. Eurocopter is planned to deliver and hand over the second and the third helicopters to the Lithuanian Armed Forces by the end of the year. “We are retiring dated Russian-manufactured helicopters and continue to fit up our armed forces with western equipment. It matters to us that our pilots will fly more up-to-date, new and more efficient aircraft, Minister of National Defence Juozas Olekas says. Minister also underscored that the first helicopter will also serve to fulfil Lithuania’s commitment to the nations completing the NATO Baltic Air Policing Mission by ensuring search and rescue function. As laid out in the arrangement of cooperation with the Ministry of Environment, the Lithuanian Armed Forces is committed to use no less than 75 flight hours for environmental observation and control annually. The AS365 Dauphin will complete environmental monitoring and control from the air tasks and search and rescue missions: search for people lost at sea, extinguish fires, transport patients or organs for transplantation, support state and municipal institutions in emergencies. The Lithuanian Armed Forces signed the procurement contract with Eurocopter on three Eurocopter AS365N3+ Dauphins in October 2013. The total value of the contract t amounts to roughly EUR 52 m. The price includes purchasing price of the three helicopters, all related equipment, training of pilots and maintenance personnel, and three-year after-sales services.